Garden City, New York (December 20, 2017) – The need is great throughout the year, but during the holidays more can be done to bring joy to the faces of those who risk going without. 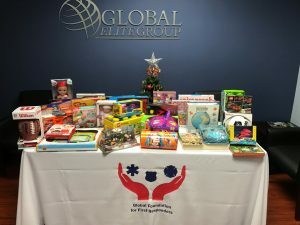 The Global Foundation for First Responders along with the staff of Global Elite Group, participated in John Theissen’s Children’s Foundation’s, 26th Annual Toy & Fund Holiday Drive. The John Theissen Children’s Foundation helps sick and underprivileged children throughout the year, and during the holidays with a Toy & Fund drive. The GFFFR collected a large assortment of toys for distribution through this worthy foundation. “We all have so much, being able to provide gifts for The John Theissen foundation and collect over 200 pounds of food for Island Harvest, has made this holiday very special for us. In all, 2017 has been a wonderful year of giving for the Global Foundation. Our charitable reach continues to grow and this is something to be very thankful for,” remarks William McGuire, Founder and Director of the Global Foundation for First Responders, Garden City, NY. Island Harvest, Long Island’s largest hunger relief organization, delivers millions of pounds of good, surplus food to over 570 Long Island-based food pantries, soup kitchens and other non-profit organizations that offer feeding services for those in need. 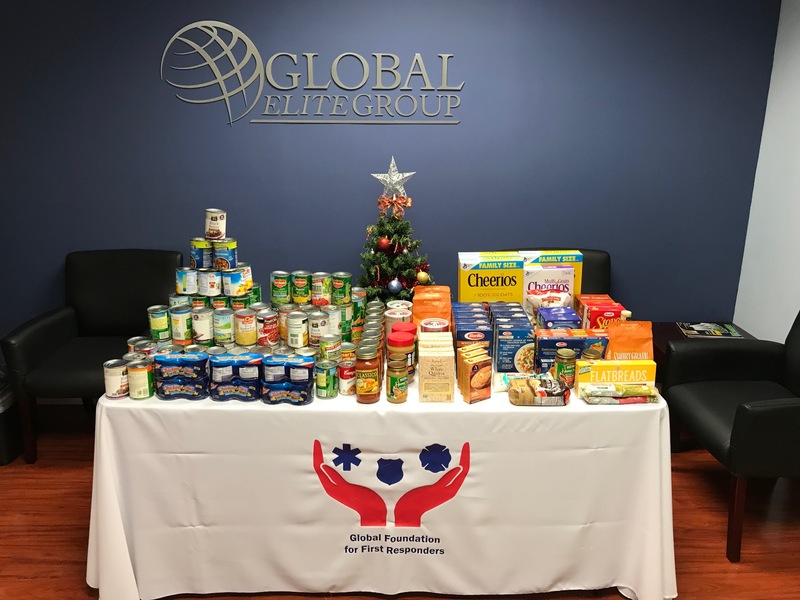 The Global Foundation was proud of their staff and those that contributed to a 200-pound donation this year! “Our staff, friends and family have huge hearts, helping to make this a great success and one we hope to top each year,” adds McGuire. William McGuire is a native of Long Island and a former Fireman from Mineola. He started the foundation nearly two years ago after witnessing the ever-increasing needs of families of first responders first hand. It became his passion to give back to all that serve leading to the development of Global Foundation for First Responders. McGuire is also the President and CEO of Global Elite Group, an international security company headquartered in Garden City, serving the needs of the aviation safety industry, event management and property security for companies worldwide.